We create a detailed and dimensioned floor plan for each space. From this, you will know how each space will be laid out and where each element will be placed. 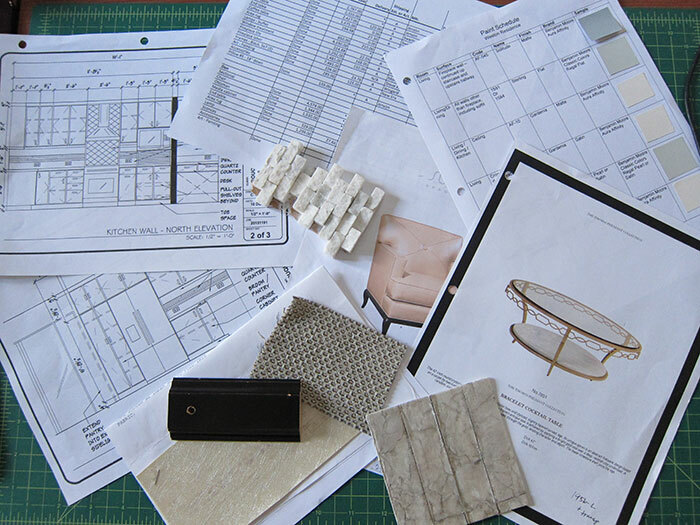 We prepare an itemized description of each element of your design – including furniture specifications, fabrics, color palettes, wall treatments, window treatments, fixtures, surface materials, and more. For built-in pieces or custom furnishings, we provide detailed elevations or dimensioned drawings to communicate specific details to the contractor or fabricator. We also create renderings of the proposed space so that you can easily visualize the end result. Once again, we get together to go through the entire design and review each of the selections. This is an opportunity for you to see all of the pieces of the puzzle put together and make sure that they all fit.